Kathleen Lamkin-Kennard, an associate professor of mechanical engineering, and her students are inspired by nature to build robotic technologies that can be incorporated into wearable devices. Making a robotic fish means researching and studying how real fish move. 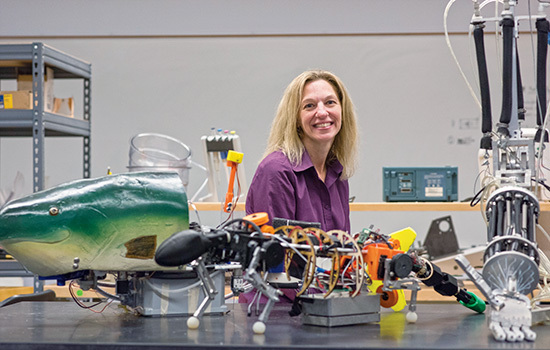 It’s an assignment Kathleen Lamkin-Kennard gives to her engineering students, and although they give her puzzled looks, it is the first step in designing a robotic creature that moves as sinuously as a real fish. “I was looking for a fun senior design project. Students like to build things, and the soft, stretchy muscle actuators (artificial muscles) are lightweight and present an interesting design challenge,” said Lamkin-Kennard, an associate professor of mechanical engineering. While whimsical, it is serious science where flexible muscles designed today could be part of better functioning assistive technologies for people tomorrow. Lamkin-Kennard’s students are learning to understand motion and to replicate it through technology that might mean mobility for individuals who may not have had that option before. Lamkin-Kennard’s work builds on her experience in industry, where she helped to develop a high-fidelity, robotic patient simulator device. She used that experience to create unconventional senior design projects, starting with a robotic hand in response to increased interest in prosthetics and wearable technologies. That early work proved soft muscle actuators could be used for different types of motion. New projects evolved into robotic systems that walked, jumped and swam. “There is a big push in the robotics field for taking inspiration from nature. There are some very efficient designs in nature and in the bodies of animals that are just so spectacular. How can we use that?” said Lamkin-Kennard, whose menagerie of robotic animals now includes an ant, otter, trout-like fish and multi-leg crab—all built using flexible actuators and sensor technology. Each project challenged the students to expand capabilities from movement on land to motion underwater, from increasing the number of sensors included in a design to ensuring that the mechanical systems were waterproof. “We made these robotic creatures. But for me, it is really the end goal—how can we adapt this?” said Lamkin-Kennard, who continues to adapt this work, collaborating with peers in RIT’s assistive technology group, expanding techniques for exoskeletons and surgical robots and using newer, stretchy elastomeric materials that are able to hold an electric charge. Using that charge, the material contracts, similar to the way human muscles do after receiving an electrical impulse from the brain. What if more assistive devices could be built with this technology? “That’s what we are looking at long term,” she said.